Today we are going to be peeping Tom's in one of my new favorite go to blogs, White + Gold Design. I mean what is not to like? They say it's all in a name. I love the white and I love the gold. Marianne has the most incredible aesthetic. She has a way of making each and every space look as though it belongs in a Williams Sonoma Home catalog. For serious. She is sharing her master bedroom with us today, and I am quite certain I want to invite myself over as a house guest. Take it away Marianne! Hello Sadie + Stella readers! 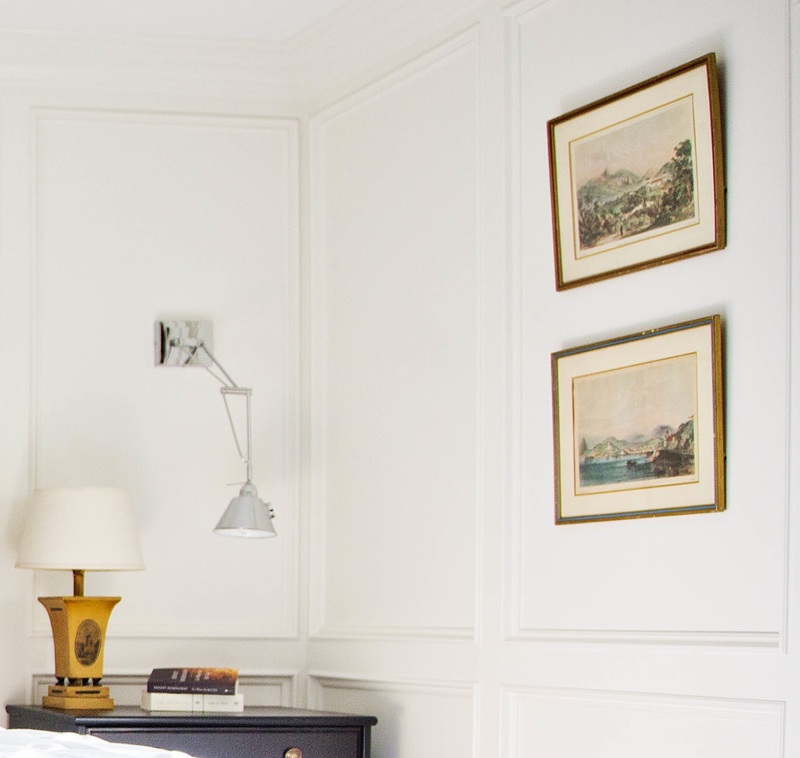 It's Marianne from White + Gold Design sharing my favorite room with you. A big thank you to Lindsay for inviting me to guest post! I really do love every room in my home for different reasons, but my personal favorite room is my master bedroom. I don't know if it's because I like the way it turned out as much as it's my respite from the chaos of my home. I knew I wanted a master that was somewhat gender neutral. My husband needs to feel like he's still a man when he's in his bedroom, right?! So I thought white + black is classic and neutral enough, but it's still bold. I had a white custom headboard made with extra padding on the back and the sides because my girls love to climb into bed with us and they lean against the back of the bed to watch shows in the morning. The white bedding is from Target (a knock-off of the West Elm cover which I recommend over the Target one - I don't love the fabric). Our side tables/drawers are from Ikea and are super affordable. I added new hardware to them and the funny thing is that the hardware cost as much as the chest of drawers! I'm a sucker for great hardware - it's jewelry for your furniture. The whole room has wainscoting as well. I love the richness and dimension wainscoting adds to a room. The library sconces provide just enough light for reading and I like that they are chrome and not all of the finishes in the room are brass and too matchy matchy. The framed lithographs are vintage from a consignment store. They are landscapes of Brazil - which is special to my husband who served an LDS mission in Brazil for 2 years. Don't you love it when you find something super cool at a consignment store?! The rug is another great find from Ikea. I love the graphicness (yes I just made that up) of the rug. It adds so much to the room and it was so affordable. 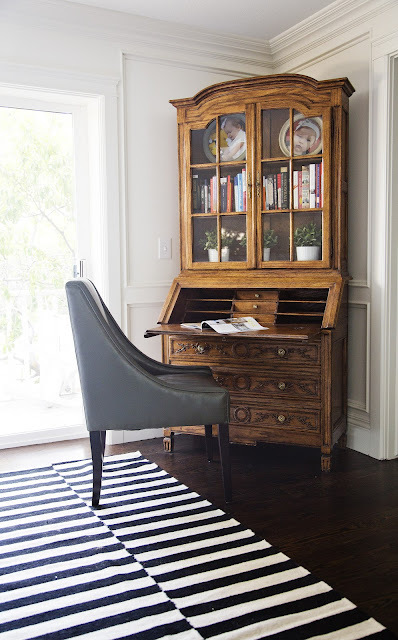 The secretary desk is an inherited piece from my Mom (who passed away a few years ago) and the chair is from World Market. I love secretary desks. This one was used all the time by my Mom who used it to store her greeting cards and her favorite books. I'm not very good at writing thank you cards, etc. but this desk makes me want to revive the lost art of the handwritten note. And that's my master bedroom! It's simple but a special place in our home. Thank you for letting me share my favorite room with you. what a fantastic room...love that moulding! I am so obsessed with her aesthetic! I stalk her blog and love every project. I just love all the simple colors and clean lines with some awesome antiques thrown in! Just my style! What a beautiful simple room! I love the white bedding and headboard. Thanks for sharing. That rug is from Ikea??? LOVE it!! I love the molding in the bedroom. So chic! What a gorgeous combination of elements! Perfectly put together pieces that have a special meaning and it's fresh, classic and modern all at the same time! Wow gorgeous!! I'm pretty sure I have that same duvet but my master bedroom doesn't even come close to looking this good. So well put together. Stunning room and I adore the ikea pieces that look so high end. Love this. I knew gold would come back! The stark white is such a beautiful backdrop that highlights all the design. Beautiful! Great room...and I love the mix of high end and low end to create the perfect balance. I really want to attempt a very 'white room' with navy touches. but I dont have molding which is always what keeps from thinking its possible. anyways great room! Everything is perfect in this room! I really love it! OMG the bedroom seems to be a real joy for living. You gave handy ideas here. Thanks for the share.